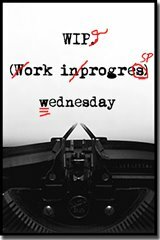 Posts WIP Wednesday: Writing (and migraine) Updates! It’s been a while since I could look at WIP Wednesday without guilt. Usually I’m thinking, “Man, I’m so behind! I didn’t achieve anything,” blah blah blah. But today I’m completely satisfied. My goal is to have the Williams Syndrome project in the hands of my agent by Halloween. This gives me incentive to push and finish it, and it also gets it off my plate so that I can focus on NaNoWriMo. Yes, I know…last year I thought I was finished with NaNo, but darn it, NaNoWriMo, I can’t quit you! I also wrote two chapters and made some executive decisions regarding The Bright, Shiny New Novel which is tentatively titled “Stormlight”. It’s the first thing that I’ve ever sat down and plotted out before. I’m definitely not an outliner, but I wanted to try something new. Anyway, I was doubting my sanity about this one. The story wants to veer away from its intended course and add all kinds of weirdness to it! Suddenly it became spec fic, and I was trying to purposely steer away from that. I was ready to throw in the towel when my writer’s group came to my rescue. They liked the story, they liked the ideas that I wanted to play with, and they advised that I rein it in and see what I could do. I wrote a pivotal scene in my head on the way home from the group, and that rocks! Migraine wise, I’ve been eating clean for a week now. (I blogged about that last week.) I did really well, although not perfect. For one thing, I realize that I munch on whatever I’m feeding the kidlets without even realizing it. And I didn’t account for days when I’d be doing hours and hours worth of errands! But I’d say that I stuck to it 90% of the time, and for those of you who aren’t familiar with my sweet tooth, that is an amazing feat indeed. Migraine-wise? I haven’t had one for the last two days. Whether it’s diet related or because I tackled my overwhelming To-Do list with a fury known only in legend, I don’t know. I’m working on managing my out-of-control stress and removing possible food triggers, so we’ll see where this leads. Huzzah! How is your progress? What are you working on? I’m working on clearing out my Apex slush inbox. I had the flu two weeks ago and am afraid I got behind. Ugh. Am also nearing the end of editing “book two” and getting it ready to send out to my readers. Don’t worry, Merc. I’m sure you’ll get your WIP under control, and I’m glad you’ve been migraine free for the last couple days. I know that’s a relief. Well, I’ve been tackling 30 Days of Writing for the last six days straight. I didn’t thinks it’d be as much fun as it is, but I’m having a great time with it. Working on a script for a shirt film this week. WOOTski on the lack o’ migraines, m’dear! That’s great news. Also, I might borrow your “fury known only in legend” phrase. I may or may not apply it to inappropriate things like eyebrow waxing and feng shui. Can I have a guest spot as an untrustworthy alcoholic in your new novel? Every novel needs an untrustworthy alcoholic. So good to hear you’ll be doing NaNoWriMo as well this year. I missed out last year. Well okay, not missed out exactly, I just didn’t do it. Glad to hear you’re migraine-free (at least for a while). Changing your diet like that has got to be a feat and a half. You inspired my post today, although the poll seems to be down at the moment. I think I’m going to try my hand at NaNoWriMo for the first time this month. Wish I could get something plotted out, though. One of the kids is home sick, and I can’t get ANYTHING done. And bully for you coming up with a pivotal scene in my head. Get those visceral scenes stuck in your noggin and then write “with a fury known only in legend” to it. It’ll keep you on track! Panster and Plotter CAN unite! I’d say you were a Berserker but I’d only be half right. Not sure what the other half is right now… all wit has fled. I tend to eat a bit of kidlet chow, too. I hope those nasty ol’ headaches stay clear. Mari: Geez, woman, you’re always busy! Rock on! Jamal: I’ll have to surf over and check out your 30 Days. I so dig those, and can’t wait to see what you have to say! Cate! Let’s make “NaNoWriMo Forever” t-shirts! Not only am I doing NaNo, but I’m even attending the Night of Writing Dangerously event in San Fransisco. I’m so excited! Alison: I loved your post! I think we really do physically suffer for our art. Yeouch. I hope the migraines are gone for good! I’m really impressed that you’ve managed to make such a huge dietary change. I thought I was done with NaNo last year too–five years is plenty–but the old excitement is coming back. I guess this is a permanent thing. Ugh. My WIP will always be a wip. I started it last year sometme. Tucked it away and wrote 2 more books. Then finally I whipped it out and started edits January of this year. Guess what? I’m barely on chapter 6! YIKES! I’m still ticking away at editing and writing all the things that drive me crazy and need to come out on paper. As far as the migraines. I know that sometimes they are out of my control and I just deal with it. No known triggers and I have tried all the different things to deter them. I’m glad that things are coming along for you. Best wishes. So glad to hear the migraines are running scared! The rest is excellent too!